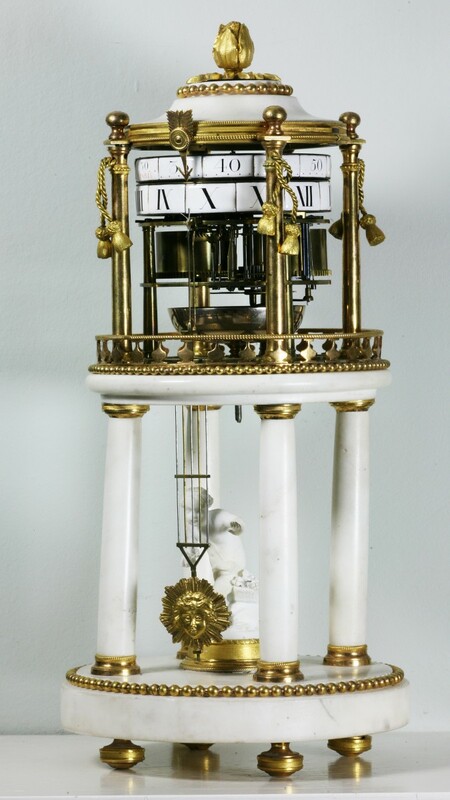 A WHITE MARBLE AND ORMOLU CERCLE TOURNANT. CIRCA 1800. An attractive ormolu and white marble cercle tournant. 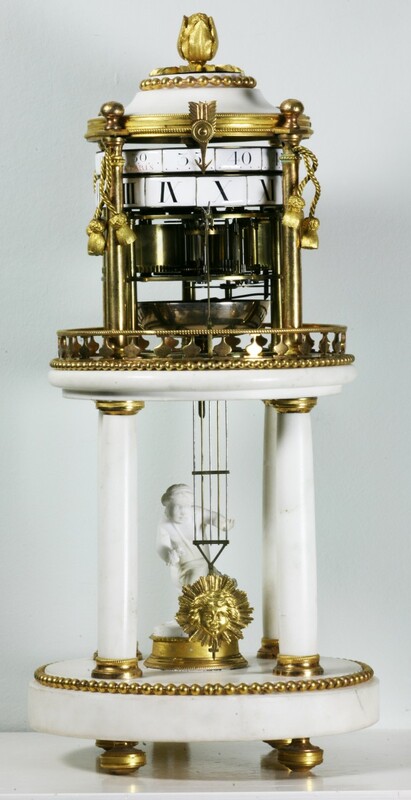 The case, of typical style with a pillared and galleried stand for the movement, has an alabaster figure of a cherub looking at a facial mask and sunburst pendulum which runs at the front of the clock. 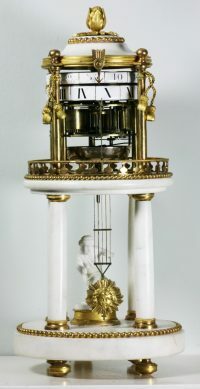 The bell striking French movement runs for some 14 days and has count wheel strike on a bell mounted below the movement. 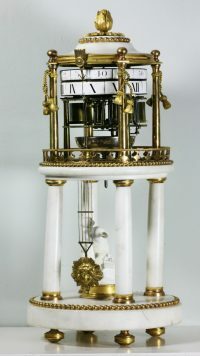 The whole movement is visible and turns the enamel minute ring and hour ring. The minute ring is also signed for the maker, as is the bottom mounting plate of the movement. 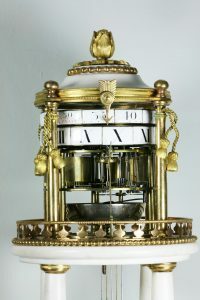 The top of the case is in the form of a flower bud which lifts off to obtain access to the top of the movement for winding. The clock has an unoriginal, but well fitting, glass dome. 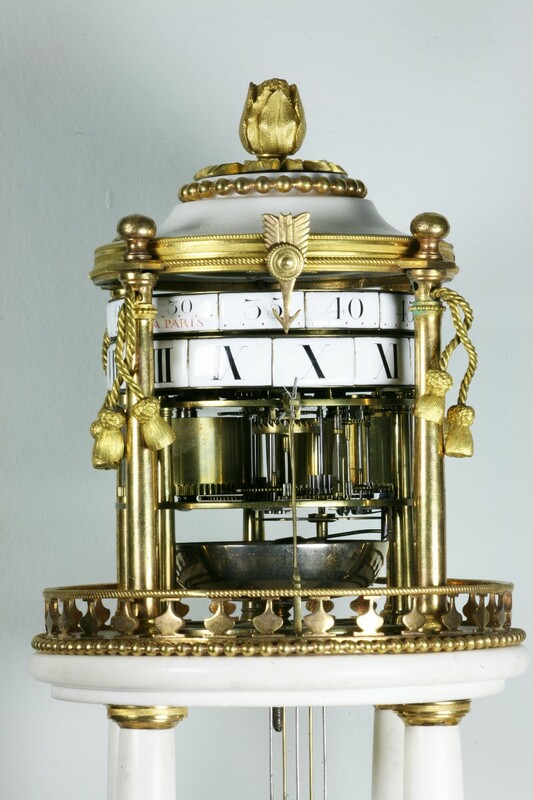 The Lechopie family of clockmakers, Adam Auguste, Adam and Philippe Adam, were working in Paris from the mid 1700s through to 1825.